NBC reports that President Trump could put sanctions on Iran, in response to the continuous terrorist activity and repeated ballistic missile tests. Iran insists that it did not break the current nuclear deal since the missile was not capable of delivering a nuclear warhead. Rezaian is sentenced to prison on charges of espionage, the country’s judiciary spokesman said Sunday, without specifying the length of his jail term. The verdict has been issued but has not been officially handed down to the accused or his lawyer. Given the fact that the verdict has not been officially handed down, I cannot reveal the details, but what I can say is that the accused has been sentenced to prison. We’re aware of the reports in the Iranian media but have no further information at this time. Every day that Jason is in prison is an injustice. He has done nothing wrong. Even after keeping Jason in prison 488 days so far, Iran has produced no evidence of wrongdoing. His trial and sentence are a sham, and he should be released immediately. Rouhani suggests that the United States and Iran could open embassies in each other’s capitals after decades of mutual hostility, but he says Washington should apologize, without going into further detail. One day these embassies will re-open but what counts is behavior and the Americans hold the key to this. If they modify their policies, correct errors committed in these 37 years and apologize to the Iranian people, the situation will change and good things can happen. Anonymous sources in western intelligence agencies have told Fox News that Russia is helping Iran violate a UN Security Council embargo and transport arms and munitions to Syria. The sources say Russian cargo flights have been delivering Iranian weapons to the Russian-operated air base outside of Latakia, a strategic city on the Mediterranean coast, twice a day for the past ten days. Iran is increasing the quality and quantity of its presence in Syria. Iranian officers are providing tactical help for Syrian commanders of battalions in direct battles, as well as weapons and ordnance, operational assistance and help with strategic planning. Ayatollah Khamenei says that Israel will be destroyed within 25 years. Some Zionists have said that regarding the result of the nuclear deal they (Israelis) have been relieved of concerns about Iran for 25 years. But we tell them that you will not see the coming 25 years and God willing there will not be something named the Zionist regime in the region. 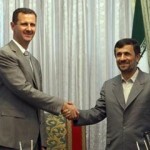 He also says says Tehran will not expand talks with the United States beyond the negotiations over its atomic program. We approved talks with the United States about the nuclear issue specifically. We have not allowed talks with the U.S. in other fields and we will not negotiate with them. The Iranian nation ousted the Satan. We should not let it back through the window. Iranian Deputy Foreign Minister for Arab and African Affairs Abdollahian announces that Tehran will present an updated version of its plan to the UN to settle the crisis in Syria. The plan will be declared and presented to the UN secretary general after precise consultations between Tehran and Damascus. It is a balanced deal that means Iran won’t get an atomic bomb. It is a major political deal. The Iran deal has a geopolitical impact and also an economic impact on the European Union. The U.S.navy says the U.S.-flagged Maersk Kensington was intercepted in the Strait of Hormuz, on Friday, 24 April, by four ships of Iran’s Revolutionary Guard naval patrol. The Iranians encircled the Kensington and followed the ship on its course for a period of time before withdrawing and breaking away. The U.S. Navy Fifth Fleet has issued a notice to mariners about the incident. Iran Revolutionary Guard patrol boats fire shots at a commercial cargo ship, the Marshall Islands-flagged M/V Maersk Tigris, and then intercept the vessel, which is crossing the Strait of Hormuz. The Tigris issues a distress call and the USS Farragut is ordered to head towards the incident. The Navy says it is “to be determined” what the USS Farragut will do when it reaches the vicinity of the incident. The Pentagon thinks about 30 individuals are on board. According to a U.S. official, there are no Americans on board the vessel and the U.S. believes that Iranians will “send the ship on its way.” A State Department spokesperson notes that the U.S. has a security compact with the Marshall Islands on defense issues. But he adds that there hasn’t been a specific request for assistance from the Marshall Islands and says it is premature to say whether this could require the use of force. It’s a key concern of the United States to ensure that sea lanes in the region remain open and safe. Rouhani vows to abide by the nuclear framework agreement it signed with six world powers, so long as they follow their side of commitments. Today we have taken a decisive step. We have reached solutions on key parameters for a comprehensive future nuclear deal. The unmanned aircraft is tested in military drills near the Strait of Hormuz. It can carry out 360-degree imaging and is designed to strike air, ground and naval targets. An Iranian military official calls it a ‘mobile bomb’ while media refer to it using the name Yasir. Last week, many countries here rightly applauded President Obama for leading the effort to confront ISIS. And yet weeks before, some of these same countries, that now support confronting ISIS, opposed Israel for confronting Hamas. They evidently don’t understand that ISIS and Hamas are branches of the same poisonous tree. ISIS and Hamas share a fanatical creed, which they both seek to impose well beyond the territory under their control. Don’t be fooled by Iran’s manipulative charm offensive. It’s designed for one purpose and for one purpose only: to lift the sanctions and remove the obstacles to Iran’s path to the bomb. Iranian Interior Minister Abdolreza Rahmani Fazli says authorities have arrested three foreign nationals traveling through Iran who are suspected of seeking to join ISIS in Iraq. He says the suspected militants are of Afghan and Pakistani origin. He doesn’t specify when the arrests occurred. There is no space in Iran for terrorist groups. Iranian security forces and the people living near the border are aware of the dangers. Abadi pointed to the presence of many dangers posed in the region as a result of the existence of the terrorist gang Islamic State which requires regional and international efforts to exterminate this terrorist organization. We feel very comfortable about the democratic process in Iraq which has reached to a logical result through selecting prime minister-designate Haider al-Abadi to form an inclusive government that comprises all Iraqi sects. The Islamic Republic of Iran will keep standing by your side. Iran backs the unity of Iraq and the stabilizing of security and considers that as a priority in its foreign policy. Heeding the warnings from US and France regulators,Qantas Airways temporarily re-routes the two daily flights from Dubai to London over Iranian airspace. Although there are international sanctions against Iran, US carriers are allowed to pay a fee to land there in an emergency. The decision comes a week after Emirates, an alliance partner, said it would stop flights over Iraq in response to information from the US claiming that Islamic militants had obtained high-altitude surface-to-air missiles from Syria. The information is currently being investigated. Today, this festering Zionist tumor has opened once again and has turned the land of olives into destruction and blood and littered the land with the body parts of Palestinian children. We are deeply troubled by this news and are concerned for the welfare of Jason, Yeganeh and two others said to have been detained with them. Now that the U.S., the five permanent members of the U.N. Security Council, Germany, they have agreed to a four-month extension, allowing these talks with Iran and its nuclear program to continue, does that mean a unilateral Israeli military strike potentially is off the table over the next four months? Now, you know I never talk about – about what Israel will do or not do. But I think what is important is that there wasn’t a bad deal, because there’s no deal. And no deal is better than a bad deal. We will see what the extension produces. I think a good deal is what was achieved with Syria. They’re under the threat of U.S. military action. And with the joint effort by President Obama and President Putin, Syria removed its chemicals and the capability to make chemical weapons. They didn’t just keep it in place, freeze it, and put it under a lock and put an inspector on it. They actually dismantled and removed. That’s not what Iran is holding out for. Iran wants to keep its capabilities and say, we will put a lock under and you can inspect it. But the whole idea for them is that, at a certain point, they break the lock. The inspector will even say they broke the lock. It will take him a few weeks to put together the wherewithal for a nuclear bomb. That’s a bad deal. Don’t make that deal, because if you think the Middle East is bad now, with ISIS, with Hamas, with Hezbollah, and with Iran, wait until Iran, one of the pre – the preeminent terrorist state of our time, has nuclear weapons. It’s clear to me that we have made real progress in several areas and that we have a credible way forward. But as we approach a deadline … there are still some significant gaps between the international community and Iran, and we have more work to do. Let me be clear, Iran will not get any more money during these four months than it did during the last six months. Speaking at negotiations in Vienna, Austria, where Iran and world powers are meeting over Iran’s nuclear program, Kerry tells reporters there have been “tangible progress on key issues,” but negotiators have yet to arrive at a “workable formula.” Despite differences, Kerry believes there is a way to make this work ahead. But and this is a critical point while there is a path forward, Iran needs to choose to take it. And our goal now is to determine the precise contours of that path, and I believe we can. Obviously, we have some very significant gaps still, so we need to see if we can make some progress. I really look forward to a very substantive and important set of meetings and dialogues. It is vital to make certain that Iran is not going to develop a nuclear weapon, that their program is peaceful. Talks between Iran and world powers resume in Vienna in an effort to reach a permanent agreement regarding Tehran’s nuclear program, as the July 20, 2014 deadline for such an agreement nears. Iran and the so-called P5+1 group of nations — the United States, the United Kingdom, France, China, Russia and Germany are involved in the agreement. Michael Mann, a spokesman for foreign policy chief, Catherine Ashton, tells reporters the six world powers are committed to reaching an agreement before the deadline. He describes the atmosphere at the talks as “very workmanlike, very serious, very determined” and said the negotiations would continue for “as long as it takes” for a deal to be forged. The deadline could potentially be extended. I am confident that the mullahs’ religious dictatorship ruling Iran will not last in the 21st century and will be overthrown. It really begs logic to expect this religious dictatorship, the founder of terrorism and fundamentalism in the whole of the region and is seeking nuclear weapons, to take international policy hostage, to continue and endure. In an exclusive Fox News interview, Rajavi laid out what she sees as Tehran’s intentions: to spread radical fundamentalism, obtain a nuclear weapon and do whatever it can to eliminate opponents, including continued executions of her supporters to silence the opposition. The mullahs do not represent the Iranian people. What the Iranian people are yearning for and what represents them, is an Iran which the Iranian resistance envisions: an Iran which is free, democratic and where the ballot box speaks, a non-nuclear Iran, with gender equality, where women and men and youth enjoy equal rights and do not threaten and endanger the world with war and challenges. Iran sends 2,000 advance troops into Iraq over a 48-hour period as President Hassan Rouhani expresses readiness to support the Iraqi government against the ISIS insurgency. An unnamed Iraqi official says 1,500 basiji militia have crossed the border into the town of Khanaqin in the central Diyala province and another 500 have entered the Badra Jassan area in Wassat province. Firing weapons at a stationary structure floating on pontoons is not a realistic representation of having the capability to target a 100,000-ton warship … maneuvering at speeds in excess of 30 knots. We are two governments and nations that are brothers. If it were not for Syria’s resistance against the Zionist regime [Israel] and its supporters, no country in our region would have remained safe from the Zionists’ aggression and there would be no sign of Palestinian resistance…Re-invigorating the front of resistance will not only persuade other countries and nations to join the front, but also pave the ground for the consolidation and stabilization of peace in the region…Syria is a benefactor to Muslims, Arabs and even to humanity. There has come into being a kind of a Shia belt from Tehran through Baghdad to Beirut. And this gives Iran the opportunity to reconstruct the ancient Persian Empire — this time under the Shia label — in the rebuilding of the Middle East that will inevitably have to take place when the new international borders [are] drawn. Because the borders of the settlement of 1919-’20 are essentially collapsing. That gives Iran a very powerful level from a strategic point of view. I consider Iran a bigger problem than ISIS. ISIS is a group of adventurers with a very aggressive ideology. But they have to conquer more and more territory before they can became a strategic, permanent reality. I think a conflict with ISIS — important as it is — is more manageable than a confrontation with Iran. They have cut the throat of an American on television. This is an insult to the United States, which requires that we demonstrate that this is not an act that is free. I would strongly favor a strong attack on ISIS for a period that is related to the murder of the American. Then, we have to go into the long-range problem. I think when we are dealing with a unit like ISIS, we should not get into a position where they can lead us by establishing ground forces. But we should set strategic objectives where we thwart any goal they set themselves, which we should be able to do by superior air power. And then, if we can enlist other countries, or other more local groups to do the ground fighting, we might actually destroy them.